Well here we are in 2014. This bog (typo and it’s staying) was sadly neglected in 2013 for a crapload of reasons. Firstly Ingmar from evolkweenthemusical and I started The Antidote Podcast which meant that a great deal of my listening time was spent absorbing new releases to pontificate about. Secondly I had a third kid at the end of 2012 and that little rotter decided that sleep was for pussies and thirdly my job got superbusy which has been tremendously stressful but also fun. In any event the opportunities I had to listen to records for this blog were severely compromised. So I had to make a decision about whether to keep this blog going or just letting it slide into the digital ether. In the end I’ve decided that this blog will become much more active in 2014 – but the focus will change to concentrate to records that I need to share with others rather than to offer my thoughts on records that I think will generate traffic. At it’s height this blog was getting crazy numbers of visits and it was even named one of the best music bogs in Vice magazine. That was great for my ego but I think I lost sight of the reason why I started this bog in the place. So there you go – no more negative reviews. If I didn’t like it you will no longer find it written about here. DBS will now only have reviews of records that I think noise nerds are going to enjoy. So here we go. Let’s face it 2013 was a pretty ordinary year for music and I wasn’t particularly inspired by much which essentially meant that my non-podcast purchases focused on nostalgic trawls through discogs and ebay. Nurse was a late night purchase on ebay which I discovered when I was looking for out of print Whitehouse records. 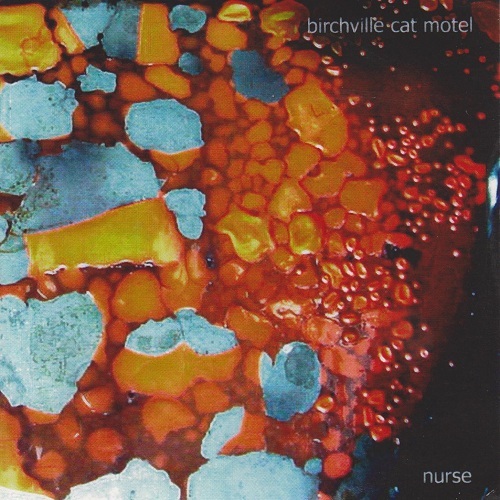 Anyone who has followed this bog since it started in 2006 will know that the work of Campbell Kneale aka Birchville Cat Motel has been pretty well covered. In fact at least two of his records With Maples Ablaze and Our Love Will Destroy the World (the title he later took to name his new project when Birchville was retired) are in my top 20 records of all time. Although I enjoy his rock-pig and psychedelic guitar records such as Bird Sister Blasphemy and Astro Catastrophes, I think his best work is defined by his shimmering, ecstatic drone work. Nurse consists of one half hour untitled. The thing that sets it apart for me though is the use of beats. It almost starts like a Vladisav Delay minimalist techno record before the high pitched drones cascade over the top and a sublime white noise drone takes over. Yet like the best drone this record took me on a journey. There are subtle and not so subtle interjections of noise and found sound which makes this one of the best things I heard in 2013 especially as many noise artists started becoming more overt in there explorations of beats. I can’t recommend this enough. There are copies on discogs for sale which aren’t prohibitively expensive – yoiu may want to check it out. This entry was posted on January 2, 2014 at 11:10 pm and is filed under Uncategorized with tags Birchville Cat Motel, Drone, New Zealand Undergound, noise. music. You can follow any responses to this entry through the RSS 2.0 feed. You can leave a response, or trackback from your own site. Good to have you back! beyond the Dead C, i didn’t know much about noise until I started reading this site regularly.